Ripple price started an upside recovery and moved above the $0.4800 level against the US dollar. There was a break above yesterday’s highlighted crucial bearish trend line with resistance at $0.4880 on the hourly chart of the XRP/USD pair (data source from Kraken). The pair may continue to rise towards the next resistance near the $0.5180 level. Ripple price is showing a few positive signs against the US Dollar and Bitcoin. 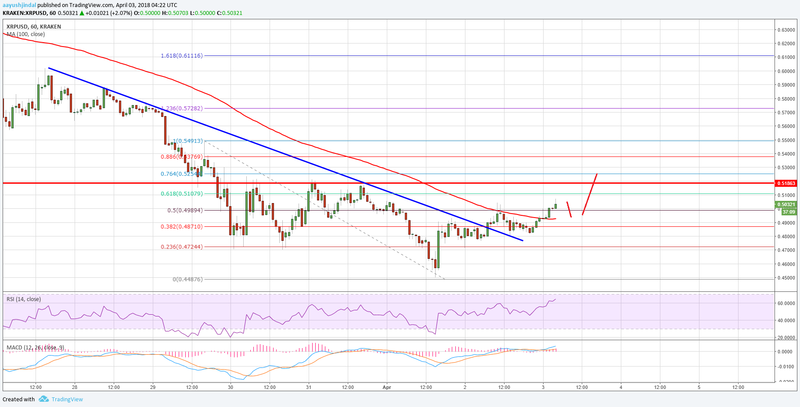 XRP/USD could correct further higher as long as it is above $0.4800. There was a decent upside move started from the $0.4485 swing low in Ripple price against the US Dollar. The price traded higher and succeeded in trading above the $0.4750 resistance. Moreover, there was a break above the 23.6% Fib retracement level of the last downside move from the $0.5491 high to $0.4487 low. These are positive signs above the $0.4750 level. More importantly, there was a break above yesterday’s highlighted crucial bearish trend line with resistance at $0.4880 on the hourly chart of the XRP/USD pair. The pair also succeeded in settling above the $0.4800 level and the 100 hourly simple moving average. At the moment, the price is trading just above the 50% Fib retracement level of the last downside move from the $0.5491 high to $0.4487 low. It may continue to rise towards the $0.5100 and $0.5180 resistance levels if the price gains traction. Above $0.5180, the price could even trade towards the $0.5500 level. On the downside, the 100 hourly SMA and $0.4900 is a short-term support. Below $0.4900, the $0.4800 support must holds declines. If the price fails to stay above $0.4800, there could be a retest of the $0.4500 level. 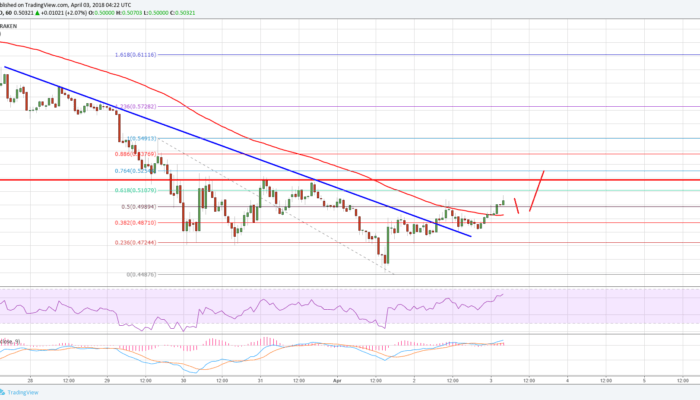 Hourly MACD – The MACD for XRP/USD is slowly gaining pace in the bullish zone.